20GHz RF Over Fiber Transmitter & Receiver. The Tx unit uses an optical transmitter to convert RF to optical signal. The Rx unit converts then optical signal to RF signal. The two units are connected by the customer’s fiber. With our wide-band units, cable operators can locate their broadcasting equipment centrally. 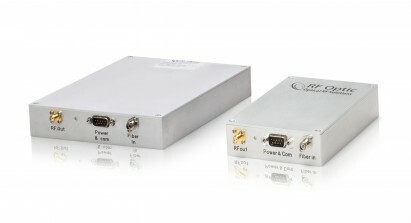 The RF is connected through fiber to the remote location. This reducing the CAPEX and OPEX of their networks significantly.